Quickly send out your message to thousands of people. Send phone calls, text messages, and emails. 100% web-based, no software or hardware needed. Great for both general and emergency notifications. Completely free to try - get started in minutes! Over 80,000+ Organizations Rely On Us to Deliver Millions Of Voice & SMS Messages! Our easy to use voice broadcasting system lets you send your voice message to an entire list of phone numbers in seconds. Create your text message and we'll send it out to everyone on your list. Keep track of responses and reply back with our 2-way SMS. Our amazing customer support team is here 7 days a week to help with any questions or issues you might have. Call us right now at 1-800-928-2086. Our customer's privacy is our utmost concern. We never release or sell information in your account. All data in your account is strictly yours. Whether you're sending a text message or voice broadcast you'll get a detailed report within minutes after your broadcast is sent. Don't waste your time adding numbers one by one into your account. Easily import all of your phone numbers and contact information in seconds. Now you can also use our service to send text message broadcasts! Our SMS Broadcasting lets you easily send mass text messages in seconds. We also offer Keywords and 2-way texting to create your mobile marketing campaign today! Use DialMyCalls on the go with our free mobile apps. Anytime. Anywhere. 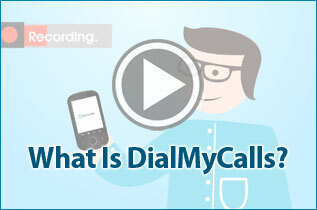 Now you can use our smartphone apps to access DialMyCalls from anywhere. Easily create messages, send broadcasts, and view reports right from your cell phone! I use DialMyCalls to keep my Girl Scout troop informed of meetings, field trips and events. It is a great time-saver - I make one recording and it calls each parent and e-mails them, too. I can even schedule the call ahead of time! Wow! This is great! Rain outs are a fact of life playing baseball in Oregon. With this system I can just send one message to contact the entire team and parents by phone and email-- very cool. I use Dial My Calls to contact our clients to invite them to come back in for second visits. It makes getting repeat business easier!